Rurik Rakoczy by Heather Kreiter. Art for the upcoming Den of Fiends pre-constructed deck. New years – what do they mean? “Age is but a number” some people say, just before they are ousted by older and more powerful Methuselahs like me. Numbers are very important! For example, I have this thing for ousting my enemies in a certain order. I have to start at the left and then continue so, which can be rather problematic sometimes, when the next victim is defensive enough. So happy new year, and good luck with next prey! How come did you choose four Sabbat clans for the these first pre-constructed decks from Black Chantry? - A few years ago, Mike Nudd and I were approached to design a collection of pre-constructed decks as part of a product pitch for bringing V:TES back into publication. A Sabbat theme was chosen as a follow-up to the Danse Macabre set we developed for the V:EKN with the intention of additionally getting Danse Macabre published in printed card form. 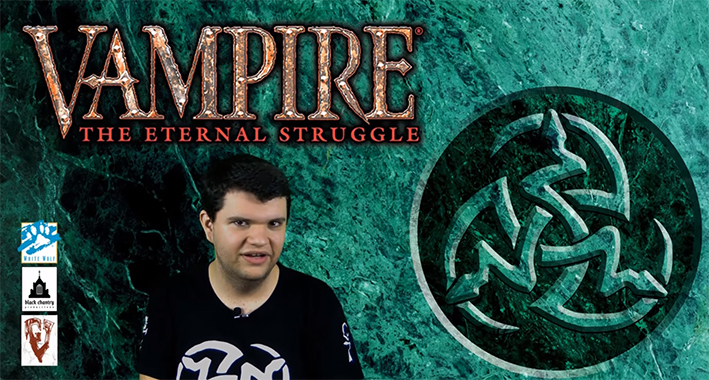 With a need for a product to help new players get started with V:TES, and with the game being published again by Black Chantry, we felt it was time to get these cards finally into the hands of the players. As for Danse Macabre, some of that set made it into the Anthology set we published and some of the crypt cards have made it into these new pre-constructed decks. The clans are Lasombra, Toreador antritribu, Tremere antritribu and Tzimisce. Why these clans? - We had a few design considerations when developing the decks. Rather than the usual “mix of everything” starter decks, we wanted to create decks that a new player could bring to their local playgroup and be competitive. We wanted them to be mono-clan decks for the sake of theme. We also wanted to offer a mix of strategies, with each deck bringing something different to the table. The Lasombra deck is a larger-capacity stealth-voter. The Toreador antitribu deck is a small-capacity breeder with Palla Grande. The Tremere antitribu deck is a Nephandus ally deck with some punch. The Tzimisce deck is an intercept-combat deck. I'm hesitant to call them “starter decks” as they're fully built and effective decks, but there's certainly room to add, modify, and tinker with them. Are there new cards? And cards with new art? - Three of the decks have some new crypt cards to help fill out their clans as well as some crypt cards from Danse Macabre. The Tremere antitribu deck doesn't – it's a classic build of the Antonio d'Erlette deck. There aren't any new library cards but the cards we've chosen for the decks should make veteran players happy. Will there be more pre-constructed decks soon? 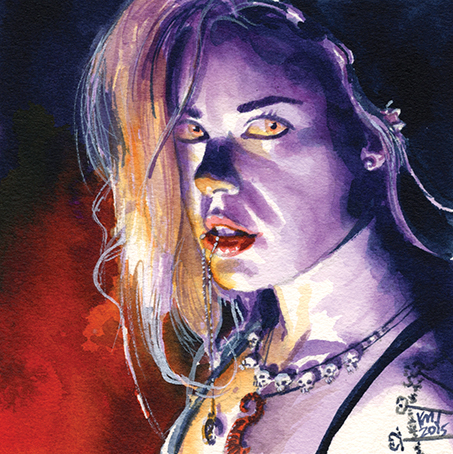 - We have another collection of pre-constructed decks currently in development and they'll tie into the V5 edition of Vampire: the Masquerade. We'll have more information about them to share in the coming months. I'm excited about this project as I'm looking forward to bringing V:TES into the present day as well as continuing it as the game we know and love. The pre-constructed decks contain 89 cards at a suggested retail price of $22-24/€20. More information will follow, so keep an eye on Blackchantry.com and the social media channels. 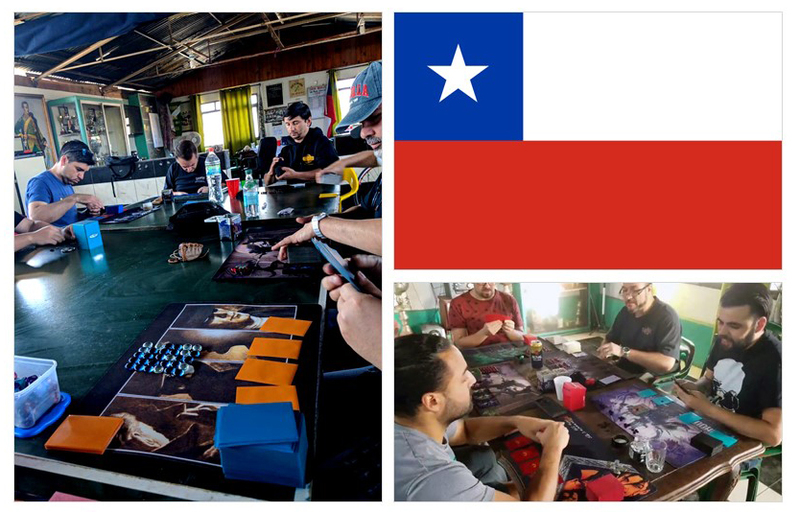 The official VEG 2018-2019 playmat, given to all participants, courtesy of our sponsor Ultra Pro. 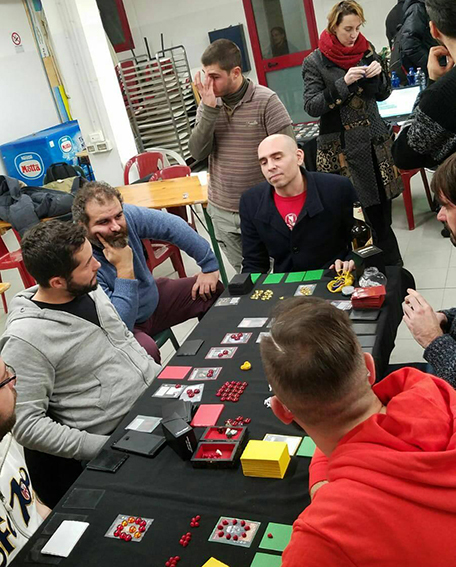 The VTES European Grand Prix Czech Republic 2019 will be played at Black Oil in Brno. More info at the Facebook event "VEG Czech Republic". 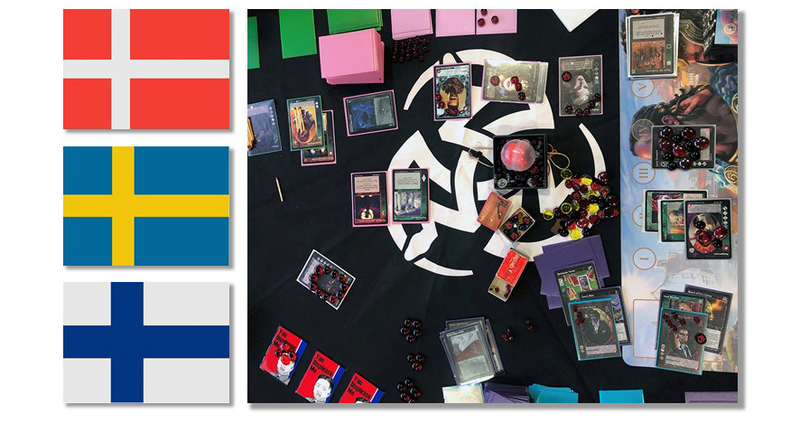 Very welcome everybody – remember that all VEG players get the awesome playmat pictured above! 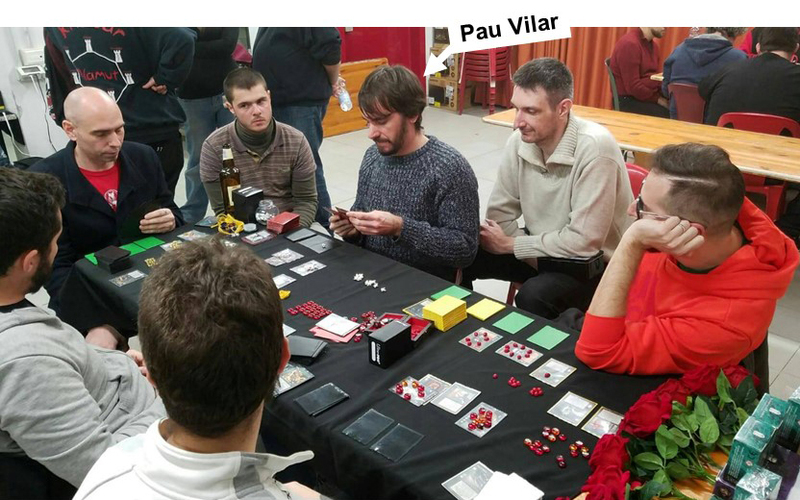 Bologna champion 2018 is Pau Vilar, scoring 0.5 victory points but winning with top seed position. Congratulations Pau! 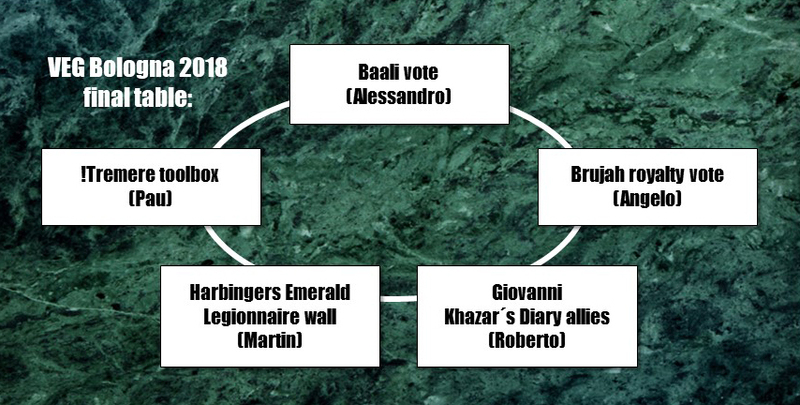 We haven´t seen a deck list yet, but reports talk of Valerius Maior, Orlando Oriundus and Frondator in the crypt. More photos and a bit more info can be found at this Facebook post. The VEG tournaments are sponsored by Ultra Pro. Players in Palma, Spain, have started producing a series of video tutorials for beginner players. Two videos are published. Please, check them out and give feedback. Non-Spanish viewers can click the icon in bottom right corner to get English subtitles. This month we have the privilige to talk to Heather Kreiter. She has made beautiful art for VTES since Third Edition back in 2006, totally almost fifty pieces. Heather, thanks for talking to us! What is your background as an artist? - When I was 14 I discovered the artwork of Larry Elmore via the Dragonlance books. These helped me to discover the wonderful world of D&D. I then became obsessed with other artists, such as Fred Fields, Jeff Easley, and Clyde Caldwell. They were all oil painters, so *I* wanted to become an oil painter so that I too could work for TSR! That was the plan anyway when I was in Junior High. I received my BFA in Painting with a secondary concentration in Illustration from Edinboro University in Pennsylvania in 1996. Even though I technically have a formal art education, I feel that I honed my skills more once I was out of school and was creating art for myself. To this day, all of my art is created via traditional methods. I work almost exclusively in either oils or markers. What kind of assignments do you like? - I know that when it comes to creating art, I am VERY slow. I do not have a “quick sketch” mode. I prefer several months notice on a project and having several weeks to work on several pieces. Basically one painting per week at the very least with a definite deadline so I can plan my work accordingly. I have two calendars and a dry erase board in my studio so that I can attempt to keep track of all of my projects. With VTES, I definitely prefer working on the crypt cards as I feel most confident focusing on a single character. However, whether it's crypt or library, the darker and bloodier, the better. I've never been one to shy away from gore. What artistical techniques do you prefer? - Whenever I get assignments I like to take a few days and let the descriptions rattle around in my head so that I can “see” what I want to paint. Once I have my idea in place, I go in search of reference material from books, magazines, friends, etc. I'll take bits and pieces from all of my source material and frankenstein it together in photoshop. Then, I'll make a sketch using the frankenstein piece for my reference, but I'll adjust everything accordingly to fit the project. Once my sketch is approved, I'll transfer it to a gessoed piece of illustration paper, block it off with painter's tape and go to it. Usually these paintings are small enough that I can kind of cradle them in my arm to work on them. I'm a very “close up” painter due to the fact that I'm legally blind in my left eye. You have made lots of art over the years. If you had to pick one piece, project or period, what are you most proud of? - As a whole, I had the most fun creating Gengis, Zach North, and Daliah for the Anarchs Unbound set. Every single one of these individuals is based on someone I know personally. Gengis is a mohawk sporting, hearse driving individual I know from the PCS (Professional Car Society). Zach North is Star Wars illustrator, and my oldest con friend, Jeff Carlisle. Daliah, is my tattoo artist, fellow collector of MLP, and one of my best friends, JerZy Milner. What work do you do mostly these days? 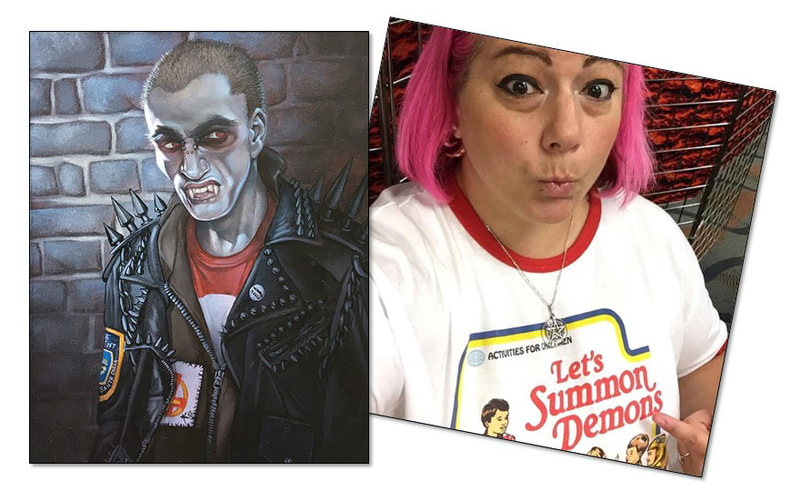 - In 2013, I pulled myself out of the freelance artist's pool in order to fully focus on my own IP, My Little Demon, a Garbage Pail Kids-type version of My Little Pony. I still continue to create original content for My Little Demon, but I've recently started to branch out into customizing pre-existing toys such as Imaginext Dinosaurs. When I learned that VTES was going to be produced again by Black Chantry, I had to dip my toes back in the pool. I can't not work on VTES! It's the only CCG I've ever actually played, back in 1995 when it was called Jyhad. Please also read our previous artist interviews, with Ken Meyer Jr, Carmen Cornet, Noora Hirvonen and Riccardo Fabiani - many more will follow! • In mid December, Heirs to the Blood and a restock of earlier products reached distributors and stores all over Europe and also Australia. 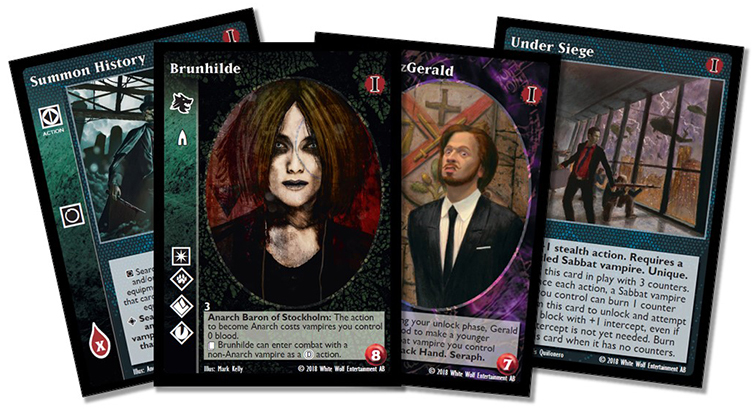 • The four Sabbat-themed pre-constructed decks are revealed – see above. Details about this will follow in the coming weeks. 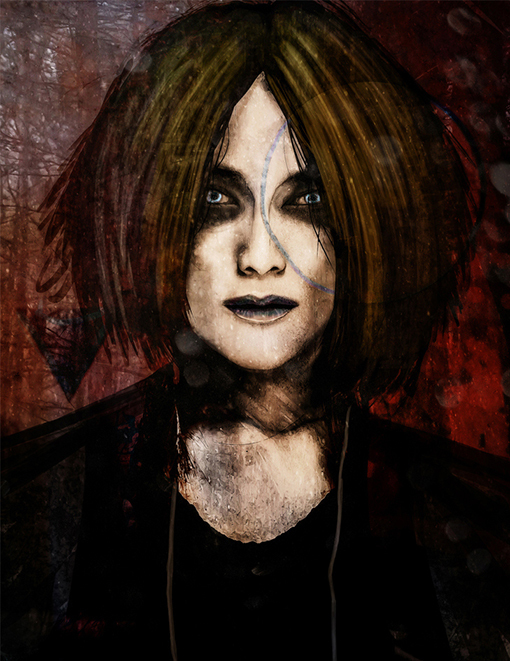 • Anthology 1 will be out at the same time as the Sabbat pre-constructed decks, if all goes well. • People ask for a new, better VTES rulebook. Bad news: You will have to settle for the current online one for yet some time. Good news: A new, better, illustrated and beginner-friendly rulebook is being produced. Black Chantry rules director Vincent Ripoll is in charge of the project at this stage – contact him via if you have any input on that. We plan to reach out for all kinds of testing and proofreading when it´s ready for that. • Ben Peal leads the design of the V5-themed box set. Setting issues have been discussed with White Wolf, and things are moving forward. More about this will be disclosed in the coming months. 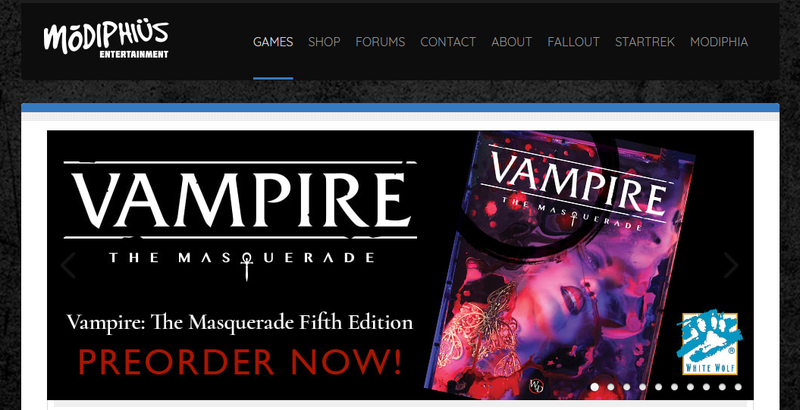 This months most interesting news about White Wolf is that UK-based company Modiphius steps in to manage and publish the Vampire: The Masquerade Fifth Edition (“V5”) product line. Modiphius has until now only been in charge of the V5 distribution, but now gets a broader deal. So, what does this mean for Black Chantry and VTES players: Not much. Black Chantry is a licensee of VTES just as Modiphius is of V5. Black Chantry might need to bounce some V5-related stuff with Modiphius, but otherwise production of VTES continues as planned. "That which we call substance and reality is shadow and illusion, and that which we call shadow and illusion is substance and reality." Carolina Vález - Art by Ken Meyer Jr.
Winter is upon us, in all its dark glory! Celebrate the darkness, and remember that the most charitable thing you can do to a fellow Cainite is to deliver her the oust. Well, not charitable to her, but to yourself, and, after all, that is what matters, isn´t it? I am sure most of you agree, deep in your heart, that is why you have reached this esteemed age. So do not hesitate the next time you have a decent hand and your prey's pool is low enough and all her minions are locked – what could ever go wrong? Organizers have announced the dates for EC 2019 in Paris, of course great for everyone who wants to plan their vacation and buy travel tickets early. VEG 2018-2019 TOURNAMENT SITES REVEALED! Also, the V:EKN and Black Chantry Productions are proud to announce that game accessory manufacturers Ultra Pro continue to sponsor the VEG circuit. If you attend at least one of the five GP tournaments you will get one copy of V:TES playmat featuring Evil Jensen (see above). Please visit the official VEG information page at VEKN.net for more information – details about each tournament will be added as they are set. 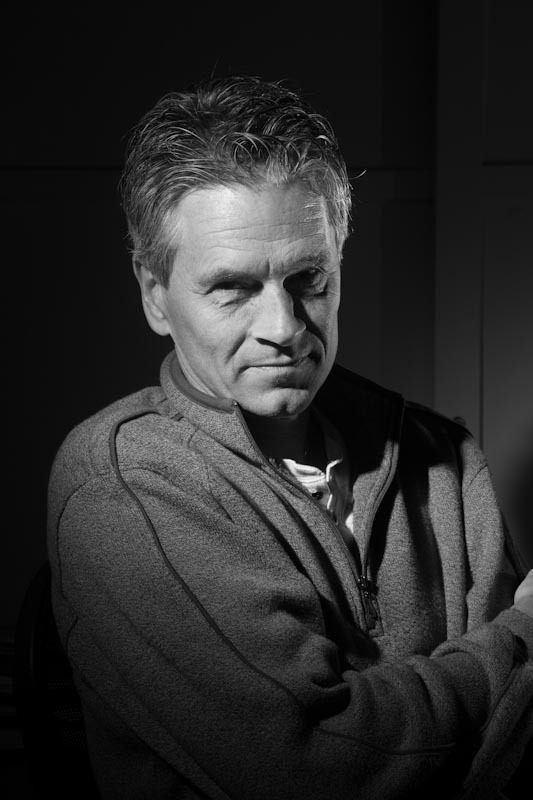 ARTIST IN FOCUS: KEN MEYER JR.
Ken Meyer Jr is one of the most iconic VTES illustrators. He has been creating flavorful and captivating artwork for almost every expansion since the original Jyhad set in 1994. Totally it has become 155 cards over the years. The VEKN and Black Chantry Productions are very happy to continue to work with mister Meyer now that the game is back in production again. You can see an example of that at the top of this newsletter – Carolina Vález from the upcoming Black Chantry product. And he also agreed to answer some questions in this interview - many thanks! Let’s start from the beginning: What is your background as an artist? - Well, I started drawing because of comic books. When I was very young, around 10 or less, I was tracing from the comics, using carbon paper. Later I would try to draw what I saw on the comic page beside the paper. Then, I made up some characters of my own, stories as well. I would try to get illustrations published in the fanzines of the day – this would be in the early to mid-70s. I always knew I was going to be an artist. Though I went to college, I was a terrible student, and the college wasn't that great to begin with, so I did not learn much. Most of what I knew was self-taught. I worked in many places; ad agencies, military contracts as a civilian, software companies, etc. I did do some comic work, but mostly for small publishers such as Caliber and Eclipse, with a few smaller jobs along the way for Marvel. But, I realized I just did not have whatever it took to really make it in that industry, though I continued to dabble in it. At some point, I did some work for a now defunct company, Mayfair Games, on a werewolf book called “Lycanthropes”. 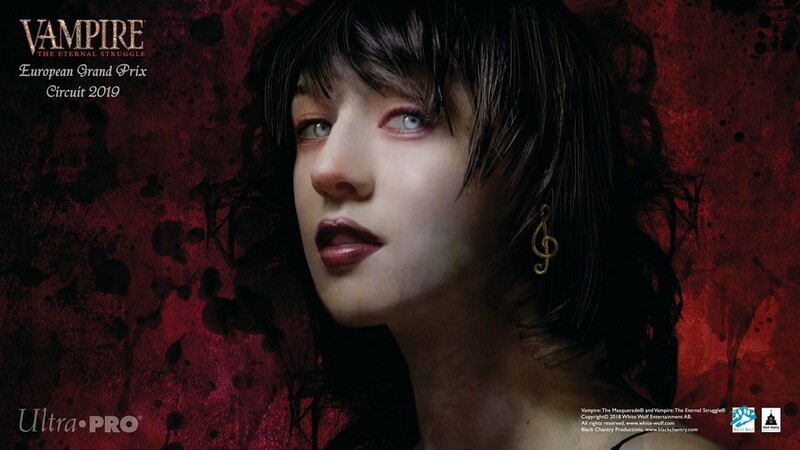 An art director there at the time, Maria Carbado, eventually went on to work for Wizards of the Coast, and because of that connection, I did some work for Magic the Gathering. But, all through that (and to this day), I did many illustrations for White Wolf games ... hundreds of paintings! I do regular work now for Onyx Path. What artistic techniques do you prefer? - As for media, for the longest time, I used watercolor primarily. I still use it, but use acrylic ink a lot more frequently. But I have also used other media such as acrylic, oil, mixed media, etc. I just use whatever seems to fit that particular job. What kind of motives do you prefer? What kind of assignments? - I have to admit, I think I work better with deadlines and exact assignments. This whole “do what you want whenever” approach doesn't do me much good. I do like working with humanoid subjects when I can. I have the most fun with pictures that incorporate some sort of dramatic lighting ... which horror is tailor made for! In fact, I did not drift into the horror gaming genre because the horror aspect, but because of that dramatic lighting that so often you see in classic horror films. Most of my work early on was black and white, which fit it even more. You have made lots of work for VTES, other games and other places – what are you most proud of? 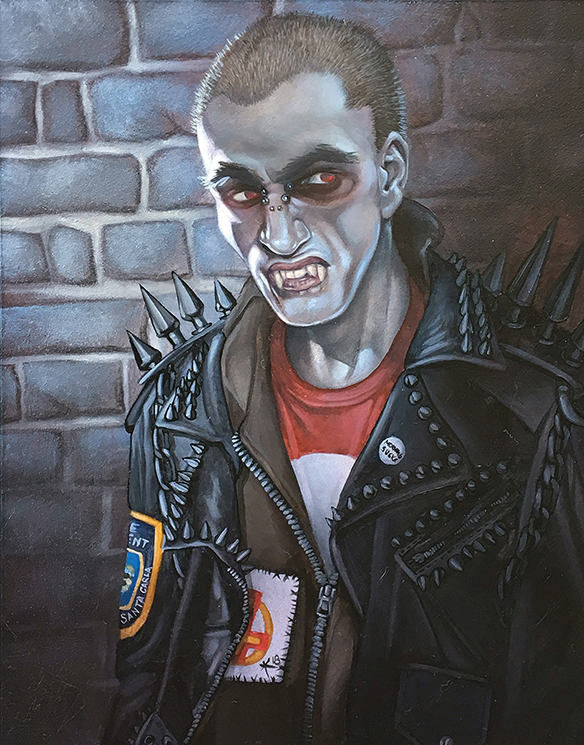 - Well, many of the portraits I did for VTES are some of my favorite pieces, for example the whole book “Kindred Most Wanted” which was all me. I just love painting people. Along the same lines, some of my favorite pieces were done for the Clive Barker game Imagica, but the game went nowhere unfortunately. Many of the pieces in my first big assignment for White Wolf, “The Masquerade”, contains many favorite early pieces. How do you work with models? Some of your pieces seem obvious model work, others are not so sure? - Yes, at some point in the nineties, even in my comic work, I used more and more models and photo references, wanting to get the work as realistic as possible, and to get all those lovely shadows. It was usually a combination of shots I took myself, some friends took for me, and references I would find in books and later, the internet. You have to be able to do at least the basic work without a model when necessary, but there are so many specific, individual characteristics that are very hard to just dream up, especially when you apply out of the ordinary camera angles and all those ... shadows! - I am always doing something! If it isn't a new Magic playmat to take to tournaments, it's altered Magic cards, or a commission... the variety of what I have done and do is pretty big. At the moment, I have four illustrations for Onyx Path, a portrait of a couple, some illustrations for an educational software company, a few "repaintings" of a few of my classic Magic cards, and god knows what else! Also, I do a monthly column on the fanzines of years gone by called Ink Stains. Each month, I cover a different zine or group of zines. They were a big part of my childhood and college years, so it is really enjoyable to me, and I like sharing them with people who had no or little chance to see them for themselves. I also teach some painting techniques at a local community college. I am also working on a cure for the common cold and a time travel machine in my spare time. Thanks again to Ken Meyer Jr for this interview. Check out his work at www.kenmeyerjr.com, where you also can find links to his Ink Stains columns. Also visit his Storenvy-page, where you can buy art and a lot of other related things. Please also read our previous artist interviews, with Carmen Cornet, Noora Hirvonen and Riccardo Fabiani - many more will follow! By strange coincidence, three Nordic countries held their national championships this month. Let's take a look at the results! Champion: Rudolf Scholz (GER) – congratulations Rudolf! Zack to the right, barely visible. Champion: Zack Holmgren (SWE) – congratulations Zack! Special thanks to all travelling players, extra special thanks to our Finland friends that showed up. The tournament took place in the same venue as the previous two years: the library in the Center of Espoo, i.e. in the middle of nowhere. Attendance was significantly up from the previous years, a whole 33% from 24 to 32 players. The renewed availability of cards and beginning revival of the game must have had an effect. And in fact, during fall 2018, weekly games in the capital region have also been increasingly popular. Who knows, next year we may be forced to look for a bigger space for the Nationals, but that will be a positive problem. The tournament was a success in other respects as well. Many players described the games as interesting and even pleasant. My personal experience supports this observation: it's hard to remember another tournament where in each of the three rounds (almost) everybody had the chance to play their own game and even to win the table. The decks were very varied, and generally not very aggressive. Even the trademark Finnish combat-heavy decks were quite few. Two game wins were required to make it to the final, and only five people did (including one with three), so the cut-off was very clear. From what I saw, the final seemed very close. 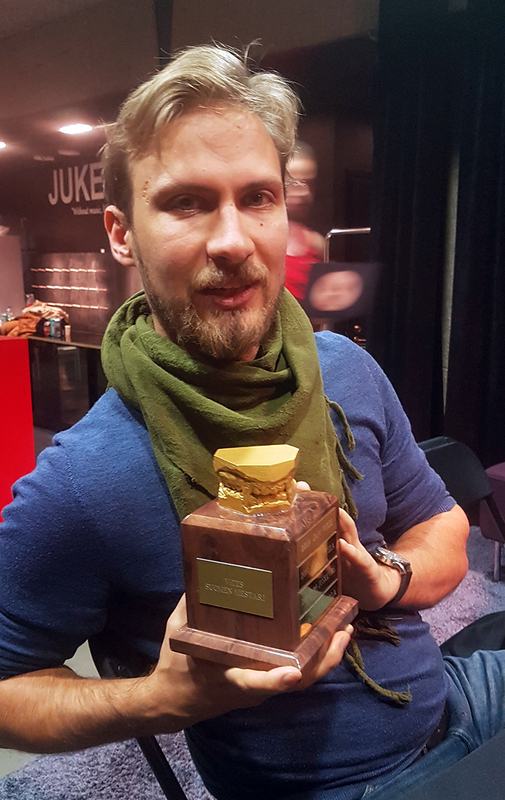 Champion: Otso Saariluoma (FIN) - congratulations Otso! For winning deck list and more information, please also read the champion's own tournament report at the VEKN.net forum – a very good read! • In the most recent production update, it was revealed that distributors are getting the Belgium printed Heirs to the Blood bundles and restock of Keepers of Tradition bundles by mid-December. So if you are a player that feels our products are missing from the shelves of your local game store – talk to the manager, and make that person talk to their distributors, who in turn will contact Black Chantry. • Four preconstructed decks are almost done for printing. If everything goes well they will turn up on both Drivethrucards and in stores early in the first quarter of 2019. • Anthology 1, which was revealed last month, is being prepared for printing. Most likely you will be able to get this too in first quarter 2019, both print on demand via Drivethrucards and normal printing in stores. • The V5-themed boxed set is being designed. Product director Ben Peal and freelance game designer Mike Nudd are in charge, and hopefully the first round of playtesting will begin really soon. There are a number of setting-dependant issues to be cleared which are being discussed with White Wolf at the moment – Ben will talk more about that in an upcoming designers' diary-text. • Rules director Vincent “Ankha” Ripoll is vetting wording all cards that are to be reprinted and also (in his spare time) rewriting the VTES rulebook. 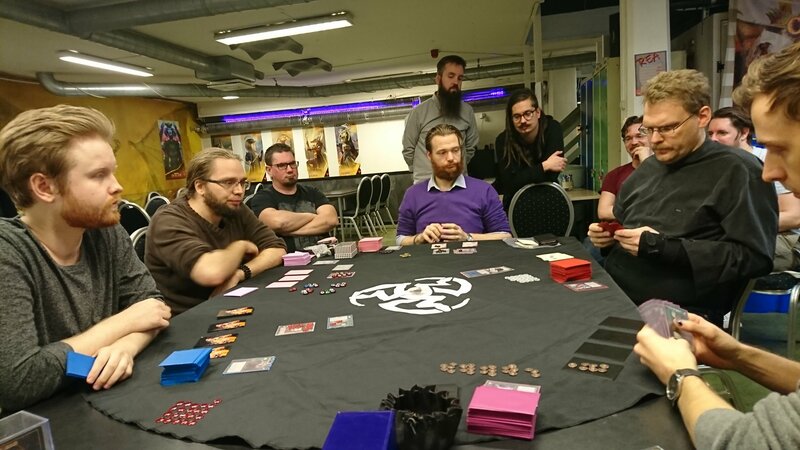 He is always pondering various changes for cards, rules and tournament rules – please check out his threads at the VEKN forum, for example about optimal seating and time limit variants for finals. Sorry for being late again! I am already snowed in because my lazy ghouls refuse to do their job, but I also have another problem. My crypt, located in the middle of a Swedish graveyard, is currently under siege by a large number of spooky, ethereal folks calling themselves “the emerald legion”. I have no idea what they really want, but they are in my way and they are prone to violence. I have consulted Tobin´s Spirit Guide, but the page about these folks seems to have been torn out. Could someone send help? Please? Q: Why do you release this set now? A: It contains many cards that are still in high demand among players. In spite of the 2017 set, cards like, for example, Enkil Cog and Monastery of Shadows are still hard to get. Q: What about the 11 storyline cards? Are they still legal for tournament play? When will they be reprinted? A: Yes, they are still legal. They will be made available again, shortly. Don´t worry. Q: When can we buy Anthology 1? A: A definitive date has not been set, and better wait to give even an approximate date. Q: Is it for print-on-demand or stores? A: Both. It will probably be made available on both Drivethrucards.com and through normal distribution simultaneously. A: The recommended retail price will be about $20/€18. • Are you a player and want VTES in your local game store? Tell your store! • Are you a store and want to sell VTES? Contact your distributor! • Are you a distributor and want to distribute VTES? Mail ! VEKN FACEBOOK GROUP = SUCCESS! 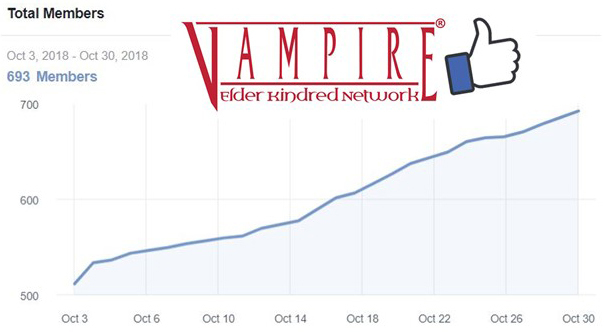 With last month’s newsletter, an official Vampire: Elder Kindred Network Facebook group was launched. Not only has it gathered almost 700 members in just 30 days, but it’s also jam-packed with posts and comments, and the mood is generally love and happiness. If you use Facebook and are not yet a member, please join – all players of VTES are welcome, as long as you follow the rules in the Discussion Guidelines and the normal Facebook rules (no fake identities, etc.). See you there! 5: Dave: "Here´s my Trujah selection; who gets to star in a deck?" • The 1000 kilograms of Belgian printed cards mentioned in the September newsletter have now been distributed in Europe, Asia and Australia. Some of it disappeared immediately due to preorders, but don´t worry – more cards are being printed! • Black Chantry is still working on how to get products to some places, for example Brazil. But options are being evaluated and hopefully solutions to these problems will be found shortly. • Black Chantry has been part of its first charity event. 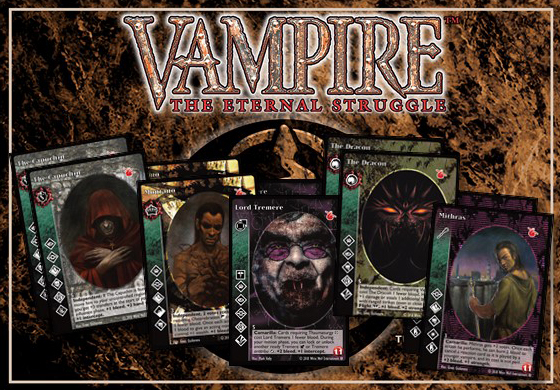 During the period 3-14 October the product Humble Bundle Exclusive VTES Set was available through Drivethrucards.com, as a part of the White Wolf Humble RPG Book Bundle. 11 560 bundles were sold of the book bundle, but how many of these will take the opportunity to get the physical VTES set is not clear. The content was two each of Lord Tremere, Mithras, Montano, The Capuchin and The Dracon. These cards will be made available again soon, but without the red Humble Bundle set symbol. “We enjoyed getting some minor exclusives out for Humble Bundle, but we'll work on making the process smoother for future similar offers”, says Black Chantry CEO Hugh Angseesing. • The first distributors list were revealed on October 18. • Anthology 1 were announced and spoiled on October 21. 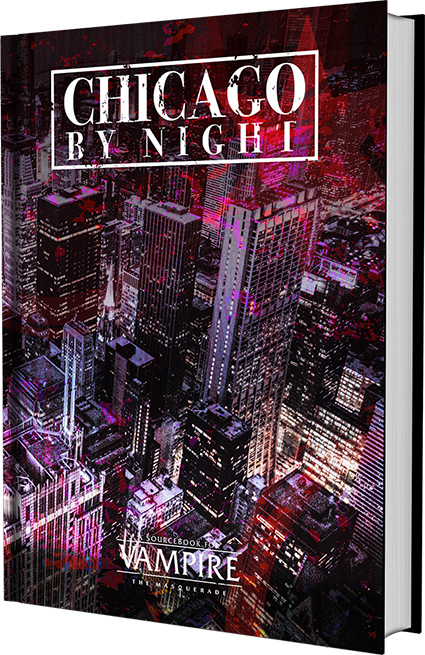 • Due to the previous problems with misprints, Black Chantry is now applying new, very thorough routines for proofreading. The whole staff are involved in this work. 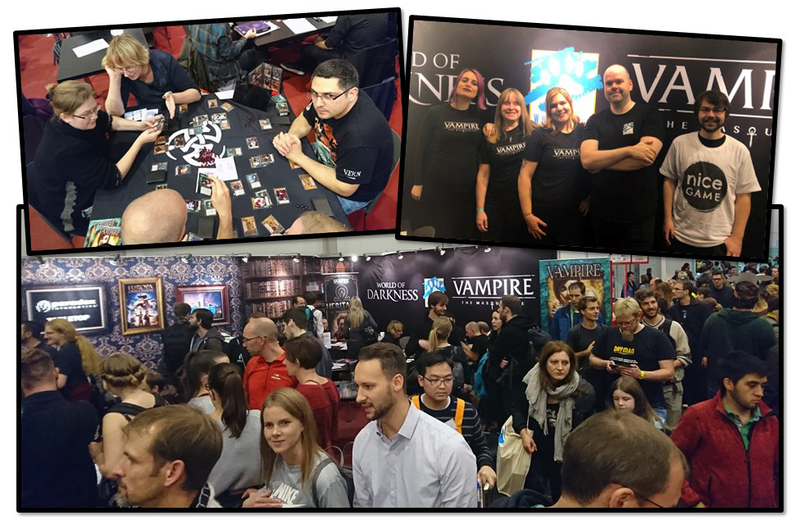 • Chief marketing ghoul Henrik Klippström attended Spiel 18 in Essen, Germany, the world’s largest board game fair. The booth was shared with Paradox Interactive, White Wolf and Nice Game. With the help of friendly players Rudolf, Ali and Mike he ran demos of VTES for three days. “It was a blast! 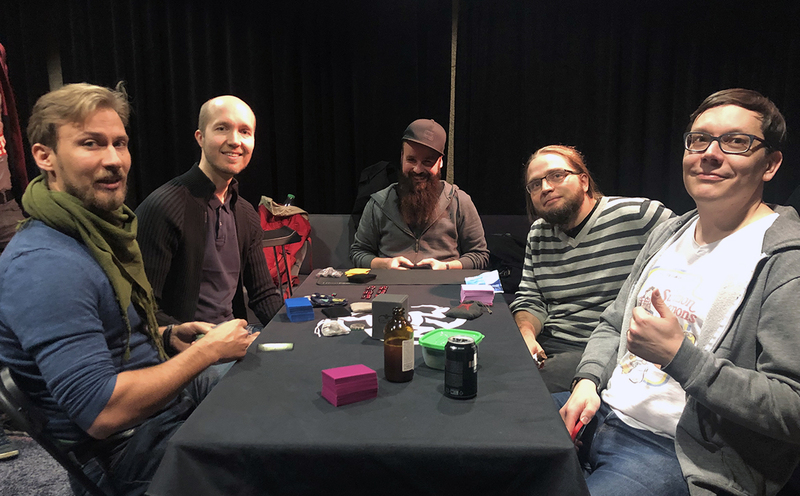 All who tested the game loved it, and MANY old time players approached me to thank Black Chantry for our efforts to revive the game – some were almost crying of joy”, Henrik says. Q: Eric Kressida's revised text says that "he can burn the Edge to move to your ready region." (previously: "you can burn the Edge to move Eric to your ready region"). Does it mean he can now burn the Edge that is not controlled by his controller? Q: Can "The Line" be used to reduce the cost of a recruit action card (e.g., Shambling Hordes)? A: Yes. Recruit action cards are action cards. Q: Who is the acting minion when Marie-Pierre uses her ability? A: Neither Marie-Pierre nor the opposing vampire are acting (for effects that refer to "acting minion"), but standard sequencing rules apply (i.e., acting player, then blocking/target player, then clockwise from the acting player). Q: What is the timing of Marie-Pierre's ability with respect to action modifiers (specifically Freak Drive)? A: She enters combat before the acting minion can play Freak Drive. The acting minion can play Freak Drive at the end of the action, as usual. Q: What if the acting Samedi successfully rushed and has Perfectionist? When do they gain the blood (not that it matters much, but just curious)? A: During the same window as Freak Drive. Q: What about the timing of reaction cards? If Marie-Pierre isn't acting when she uses her ability, can the opposing minion play a reaction card like Obedience? A: Not Obedience because Obedience works only against acting vampire (and Marie-Pierre isn't acting in that case). If the opposing minion is not the acting minion, he could play reaction cards that apply. Q: What about cards like Psyche or Telepathic Tracking? If my other Samedi was acting and combat ended with both combatants still ready, can I use Marie-Pierre's ability before the opposing minion can play Superior Psyche? A: Psyche! is played during combat, way before Marie-Pierre's ability can be used. Q: Can Marie-Pierre's special interrupt Rötschreck's effect to prevent another Samedi from going to torpor? A: Yes. Effects that end combat and then do something else after combat (all in the single resolution of the effect) will fizzle if combat doesn't end or if a new combat is started. Q: An Anarch vampire attempts to block and is successful. Can he play Guardian Vigil before combat? You: B attempts to block. *: when he says "blocked", he should say "no more stealth" or "no more effects". **: he could play stealth at this point. Q: Is Alvusia's bonus bleed or strength permanent? It says "Once each action, you can burn 1 counter from this card to give a slave Gargoyle you control +1 bleed or +1 strength." A: If an effects works "once each action" or "during an action", the default duration is until the end of the action. Feel to discuss one of these rulings? Use the VEKN.net forum or the brand new VEKN Facebook group! 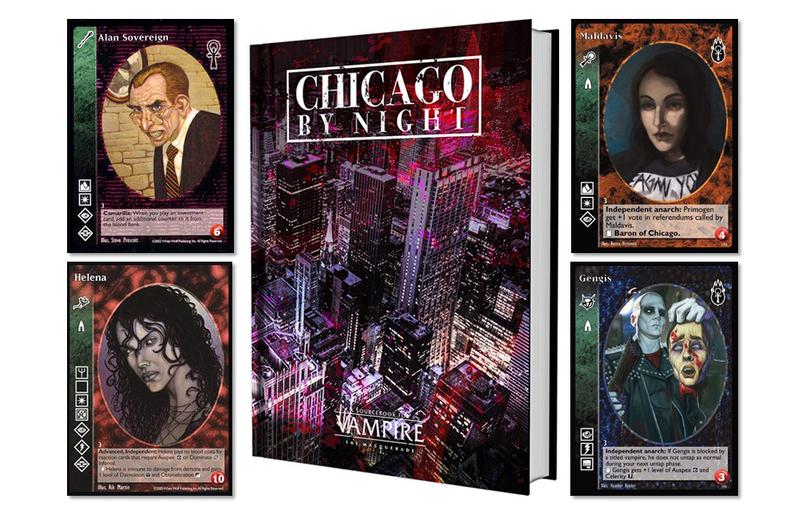 Hot RPG news: Our friends at White Wolf and Onyx Path have launched the Kickstarter campaign for the V5 edition of Chicago By Night. This is the third incarnation of this awesome city sourcebook, by some called the best setting material ever produced for any role-playing game. Many VTES cards spawn from the iconic characters of Chicago; Helena, Menele, Lodin, Ublo-Satha, Inyanga and many others. Check it out!